The above info came from Valerie, and was edited by yours truly (contact me). The image came from Amazon.com. My Neighbor Totoro is a story about two girls who move to the countryside with their father to be closer to their mother's hospital. As Satsuki and Mei explore their new house (which is haunted by soot sprites and frequented by the Totoros), they discover the world of the Totoros within the giant camphor tree in Tsukamori Forest. Later on, Satsuki and Mei meet Catbus, a giant orange cat that is a bus - but only children can see him, just as children are the only ones who can see Totoros. 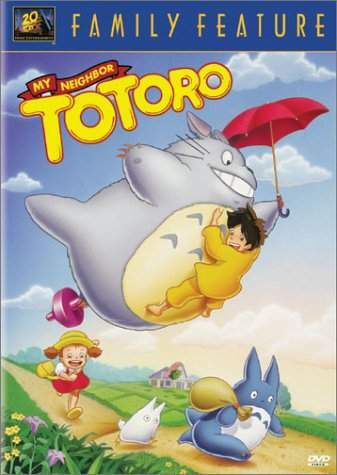 Mei and Satsuki get to play with the Totoros, but when the girls discover that their mother's recurring sickness has prevented her from visiting home on the weekend, O Totoro and Catbus jump in to help them especially when Mei gets lost on her way to the hospital. This movie will leave a smile on your face and will certainly cheer you up if you're feeling down. People of all ages will love the Totoros and their adventures for years to come. The above description came from Valerie, and was edited by yours truly (contact me).